"We need a hospital," one man said, "and a school for girls. If something could be done about the drinking water, we'd be grateful." "One day it's diarrhea, the next day it's fever, the next day, vomiting" said a village woman, speaking about her children. These villagers reluctantly spoke to their feudal prince of Ratrian, a poor village in north of Pakistan, highlighted by TVE and BBC recently. The young prince is Rafeh Malik, the son of the feudal lord Malik Atta Mohammad, whose family's vast land holdings include this village. The prince took the initiative to ask for his villagers' opinions about what needs to be done to improve their lives. Apparently, Prince Rafeh Malik has been influenced by the United Nations Millennial Development Goals (MDGs) and he wants to try and implement them within his domain. He has taken the initiative by convincing his father that it must be done. These goals can not be achieved by governments alone. In spite of Pakistani government's efforts and international assistance, Pakistan does not have a lot to show in terms of real progress toward UN MDGs. Ranked at 136 on a list of 177 countries, Pakistan's human development ranking remains very low. Particularly alarming is the low primary school enrollment for girls which stands at about 30% in rural areas, where the majority of Pakistanis live. In fact, the South Asia average of primary school enrollment is pulled down by Pakistan, the only country in all of Asia and the Pacific with the lowest primary enrollment rate of 70 per cent in 2005. This is 12 percentage points lower than that of Maldives, which, at 80 per cent, has the second lowest rate in Asia and the Pacific. However, whereas Pakistan is rapidly reducing the proportion of children out of primary school - the net enrollment rate was just 60 per cent in 2003 - the rate in Maldives actually dropped 18 percentage points between 1999 and 2005. The government effort is necessary but the real success will require active participation of private Pakistani citizens of all classes in society. People, including young, educated and enlightened feudal princes, need to come together to light candles rather than curse darkness. The mission that Rafeh Malik has embarked on is an extremely welcome and necessary effort to change the feudal attitudes toward the poor in Pakistan. There are obviously risks and fears associated with any change. But Rafeh Malik's work should be an inspiration to other young men and women of the feudal class in Pakistan. "I am scared," Rafeh told his friend Shehryar Mufti, a Dawn TV journalist, "but I'm willing to take the risk." 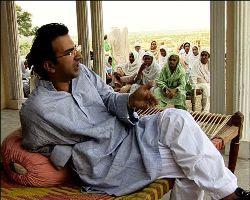 Let's hope Rafeh Malik, and others like him, succeed in bringing about peaceful and positive changes in Pakistani feudal-tribal society that will ultimately benefit all Pakistanis, including the villagers, the middle class and the feudal and tribal chiefs. It has been shown in many developed nations that peaceful transitions from traditional feudal societies to modern democratic, successful, industrialized societies have brought wealth, peace and prosperity for all. The children of the feudal lords in Europe benefited from better education and lucrative business investments to remain rich and powerful, without keeping their people impoverished and illiterate. The transitions were clearly win-win situations for both the rulers and the ruled. The alternatives to peaceful transitions will be far worse for the big zamindars and sardars in Pakistan. Resistance to change by of the feudal-tribal leaders will prove dangerous and futile over the long run. I have read your South Asia Investor Blog off and on for a few months, but this blog is off the charts. Great Work. "Haq's Musings" is one of the most informative sites I have found, recently. It has a down to Earth, straight forward and clean feel to it. Thank you for all of your hard work, it is appreciated. I was reading some stuff on the NGO by-laws. I'm registering an NGO, and needed some reading on the by-laws. So the search brought me here. Some good reading. all right its fine but impossible.those poors are working as work force for that family. The report, titled “MDGs report 2010”, launched by Planning Commission reveals that the country was lagging behind or moving slow on 25 most crucial targets out of total 33 for gauging performance on social sectors such as eradication of poverty, literacy, mortality rates and safe drinking water etc for achieving MDGs targets till 2015 envisaged under United Nations umbrella. Pakistan is ahead on six indicators while it is on track on two. The country is off the track on infant mortality-rate indicator. Pakistan is going to present the MDG report 2010 before the special session of UN next week. “Pakistan faces numerous challenges and is unlikely to achieve MDGs targets,” says the report launched here at the Planning Commission’s Auditorium on Friday afternoon in the presence of deputy chairman Planning Commission Dr Nadeem Ul Haq, United Nations resident coordinator Onder Yucer and UNDP’s country head in Pakistan. The report was prepared and launched after a gap of four years by Centre for Poverty Reduction and Social Policy Development (CPRSPD), a joint venture of the Planning Commission and the UNDP but it did not incorporate the latest available poverty figures of 17.2 per cent on the basis of survey done in 2007-08 that was also validated by the World Bank. However, the report has used the poverty figure of 22.3 per cent on the basis of survey done in 2005-06. Speaking on the occasion, the resident coordinator of UN said that Pakistan lost achievements of last one decade in the wake of recent flood. But Dr Nadeem Ul Haq was of the view that the failure of public service delivery and unsustainable growth were the main reasons for missing the MDGs targets. He said there was need to bring desired structural changes in the social service delivery as the old paradigm has failed to deliver in the last six decades. The MDGs report 2010 says that militancy, political instability in 2007-08 and transition from a military-led regime to a democratically elected government caused severe disruptions in economic and social development. On MDGs target to eradicate extreme poverty and hunger, Pakistan is lagging behind on proportion of population living below the poverty line and the situation had worsened since 2006. Pakistan also lags behind on prevalence of underweight children under 5 years of age and proportion of population below minimum level of dietary energy consumption. On net primary enrolment ratio, Pakistan was lagging behind at 57 per cent by 2008-09 against the MDGs envisaged target of 100 per cent by 2015. The country is far behind in terms of literacy rate on completion of grade 1 to 5. For promoting gender equality and women’s empowerment, Pakistan’s progress on Gender Parity Index (GPI) for primary and secondary education was slow while progress on youth literacy GPI has also fallen. Pakistan is ahead on proportion of seats held by women in Parliament. On MDGs targets of reducing child mortality, Pakistan lags behind in under five-year age group mortality rate, off-track on infant mortality rate, far behind on fully immunized children aged between 12 to 23 months and other indicators. On improving maternal health target, the country is lagging behind in terms of maternal mortality rate, proportion of birth attended by skilled birth attendants, contraceptive prevalence rate and total fertility rate related indicators. Education researchers examining a World Bank community engagement program noted its positive impact, but results varied for boys’ and girls’ schools. A brief monthly phone call to school council members in Pakistan can be a relatively low-cost, scalable way to raise elementary-school enrollment – particularly for girls – and spur school improvement, according to a new study co-authored by Stanford Graduate School of Education Professor Thomas Dee and alumna Minahil Asim. In the study, Asim and Dee evaluated the impact of the School Council Mobilization Program, a pilot initiative that took advantage of the widespread ownership of cell phones in rural Pakistan to strengthen citizen oversight of local schools. “The program cost about $50 per school and it increased enrollment by roughly 12 students in the typical primary school for girls,” Dee said. “The fact that one could drive improvement in such an important outcome at low cost is extraordinarily exciting to me,” added Dee who is also a senior fellow at Stanford Institute for Economic Policy Research. The councils were made up of a head teacher and prominent individuals in the community – including shopkeepers, clerics and parents – who served for a year. A prior effort to inform council members about their responsibilities through a three-day in-person training that cost about $180 per school had been ineffective. The initiative, which was funded by the World Bank, paid a call center to place monthly calls for 17 months to school council members at larger schools in five districts of the Punjab province. On each call, which lasted about six minutes, the same calling agent would inform a member of a specific responsibility such as monitoring attendance, increasing enrollment and school planning. Text messages were also used initially, but were discontinued because many council members were unable to read.